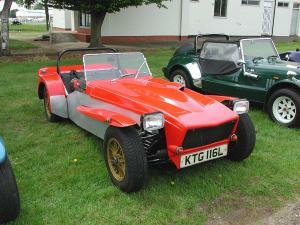 The Dutton B-Type was the second Dutton kit car creation, following on from the Dutton P1. An evolution if you like, now with mainly fibreglass panelling save for aluminium side panels. The B-Type was Triumph Herald based, utilising the running gear and engine. Being a Dutton though many other engine combinations could be used. 1973 saw the option of Ford Anglia rear axle with a 4 link setup. Front wings had recessed sidelights in them which are a good indentifier. Superceeded by the B Plus in 1974.